The Associated Press ran a story yesterday about the phenomenal growth of Washington’s wine industry. Just 10 years ago, 160 wineries supported the state’s burgeoning industry. Since then the number of wineries has grown nearly 300 percent, with winery #602 receiving its license just last month. A little known fact, the Olympic Peninsula’s place in our state’s wine industry dates back three decades, to a time when there were a mere 15 wineries in the state! Port Angeles’ Olympic Cellars, the Peninsula’s first commercial winery, was founded by grower Gene Neuharth in 1979. Formerly known as Neuharth Winery, the name was changed to Olympic Cellars in the mid-80s. Now the woman-owned and operated home of “Working Girl Wines,” Olympic Cellars continues to offer Gene’s popular “Dungeness Red” and “Dungeness White” labels. Lost Mountain Winery of Sequim was established in 1981 by second-generation Italian winemaker Romeo Conca. Currently owned and operated by Steve and Sue Conca, Romeo’s son and daughter-in-law, Lost Mountain continues to produce premium red wines in old-world style, without added sulfites. 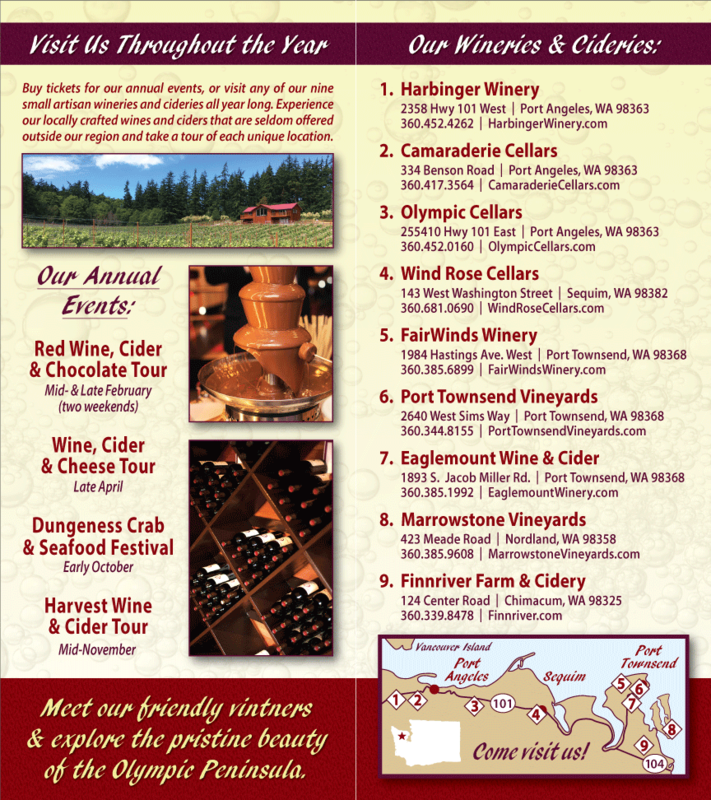 Get away to the beautiful Olympic Peninsula this spring and experience this piece of our state’s wine industry history! Olympic Cellars, Lost Mountain and the five additional wineries that have made the Peninsula their home over the past 30 years — FairWinds, Sorenson Cellars, Black Diamond, Camaraderie Cellars and Harbinger Winery — welcome you!